An expert from Canada was in Belize over the past week conducting a three-day workshop with personnel from the National Forensic Science Service who operate the Integrated Ballistic Identification System (IBIS) donated to Belize by the Canadian Government. Mr. Petar Zenovich, senior instructor from Forensic Technology, the company that provided and installed the IBIS system on behalf of the Canadian Government, was here as part of the company’s commitment to ensure proper maintenance and effective utilization of the system. Mr. Zencovich, who has been coaching IBIS operators for over 13 years, said he is very impressed with the progress made thus far by personnel at the National Forensic Science Service in applying the training they receive to operate the system. He noted that they have succeeded in creating a healthy database and establishing precise protocols in order to fully integrate the system into their daily tasks and overall function. He said he is very pleased with the extraordinary effort being put in by the entire management and staff to make the system and the program work for Belize. 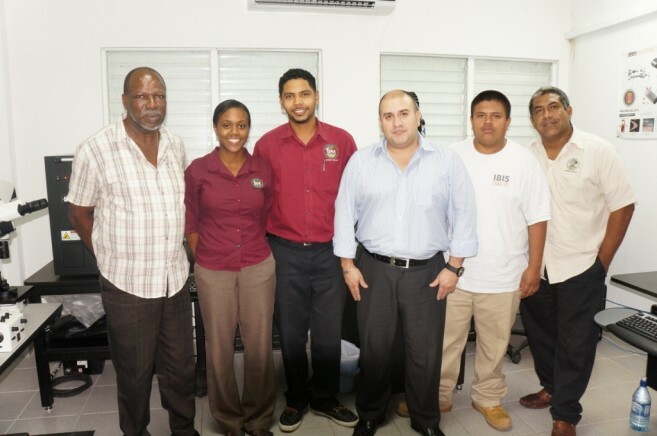 Personnel at the National Forensic Science Service who operate the system and took part in the three-day workshop include, Orlando Vera, Supervisor at the Firearms Unit; Renie Moh, Exhibit Manager and Assistant Analyst at the Firearms Unit; Mark Wallace, Forensic Analyst at the Firearms Unit; and Ebony Lyall, also a Forensic Analyst at the Firearms Unit. Director of the National Forensic Science Service, David Henderson, thanked the visiting instructor for his invaluable guidance and direction; and he congratulated the local analysts for their outstanding effort, initiative and dedication. The IBIS (Brass Trax 3D) is the most advance system with full capability to collect, store, compare, analyze and prepare conclusive reports on ballistic evidence to assist law enforcement authorities in investigation, prosecution and conviction of persons involved in firearm related crimes. It was donated to Belize one year ago by the Government of Canada.